How many times has a trip to the park been undone because you just couldn't decide what sports gear to bring with you? 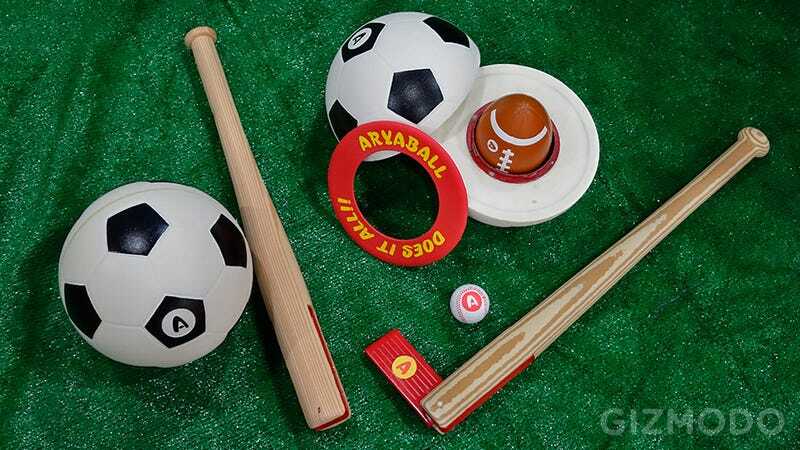 With the AryaBall kit, it's a decision you'll never have to make again because a simple bat and soccer ball turn into everything you need for playing frisbee, baseball, golf, and even football. Like a set of Russian Matryoshka dolls, cracking open the foam soccer ball reveals an inner core with a football and frisbee hidden inside. And inside the football you'll find a combination baseball/golf ball that can be used alongside an included foam bat. And the bat has a secret, too. When you're done swinging away at wild pitches, a small head on the end can be extended turning it into a tiny golf club so your kids can practice their long drives and putting game. The whole kit is actually a pretty simple idea, but it's made possible by a clever patent-pending locking mechanism that ensures the soccer ball and football aren't going to split apart after a particularly strong punt.